Much was made of the three former Big East teams entering the league this season and having to adapt to the ACC’s style of play. This notion was supported by the simple fact of sheer numbers; the returning ACC teams would number 12 teams while the Big East was sending over only three units. What did not get enough preseason attention was how the ACC as a whole would adapt to the very different styles of play of the three incoming teams, all quite successful programs in their own rights. 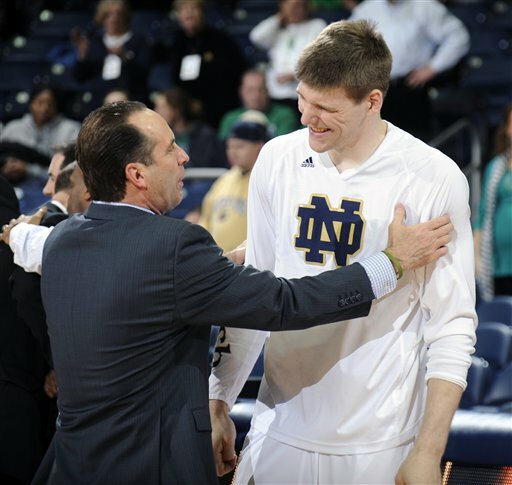 Notre Dame under head coach Mike Brey is known for its selfless team basketball, execution, cutting and the extra pass, while developing a litany of elite low post big men like Luke Harangody, Jack Cooley, and now Garrick Sherman. While the Irish lost its best player in Jerian Grant for the year, their style of play was on display and ultimately decided the outcome in a statement win against Duke. It wasn’t supposed to be this way. When the schedules initially came out, Notre Dame and Georgia Tech expected to look very different in their third ACC game than they did on Saturday afternoon in Atlanta. For the Irish, things started to devolve in the preseason with the redshirt of Cameron Biedscheid, who then announced his transfer to Missouri after Christmas. Then Jerian Grant, a preseason All-ACC selection who led the Irish in points, assists, and steals, was lost for the season due to an academic issue. Then on Saturday, frontcourt reserve Tom Knight didn’t make the trip to Atlanta due to a sprained ankle. There has been a multitude of change in the college basketball landscape this season and the ACC is no exception. Incoming teams Syracuse, Pittsburgh and Notre Dame have had good to great success in their inaugural ACC seasons, with the Orange and Panthers looking like two of the conference’s most elite teams. Even Notre Dame, likely the weakest of the three after losing star guard Jerian Grant, has had its shining moment in defeating Duke last weekend. While the ACC has taken some hits and cannot lay claim as one of even the best two conferences in the nation, those three teams have done their fair share to elevate the overall profile and are not to blame. And as the college basketball landscape shifts, so too do the tactics and strategies used by coaches and programs to keep up with competitive trends. The utilization of transfers was once something of a rarity among power conference teams and an equalizer for mid-major programs, but it is now becoming a more widespread commodity. The ACC is not unique in that regard, as the league has its fair share of transfers playing major roles on its teams this year. Transfers can often be viewed as damaged goods, and some people tend to shy away from them as a result. But with many young athletes bouncing between high schools for various reasons, it has become more of a collegiate trend in recent years for players to seek instant gratification elsewhere. Coaches have learned that some transfers can bring an instant dose of maturity to a team and provide leadership and experience to propel a team to the next level. Many successful programs today have used that to great effect, including 14-0 Iowa State and 13-1 Oregon. It is difficult for a coach bring in new players and get them to mesh properly, and sometimes it backfires. UMass senior guard Chaz Williams is a great example of a successful transfer on an Atlantic 10 contender who has played a large role in turning Derek Kellogg’s program around. While the ACC doesn’t have any of those this season, the seven ACC transfers listed below have been meaningful contributors and are not too shabby in their own right. With conference play arriving almost everywhere this weekend (it’s about time! ), let’s take a peek at some of the major Saturday (and a few Sunday) games and storylines in college basketball’s seven major conferences. Say What You Want About The AAC, But The Recently-Birthed League Will Pose A New Challenge For Memphis: Real Tests In January And February. The First Of Those Examinations Comes Today Against Cincinnati. AAC. Ladies and gentlemen, welcome to the first-ever weekend of American Athletic Conference basketball! OK, so maybe it isn’t that exciting, but an old Conference USA matchup does offer the league a headlining game on 2014’s first Saturday. 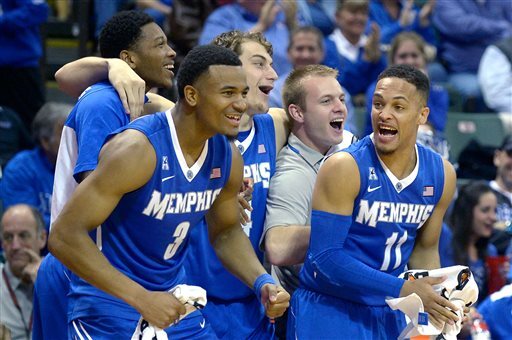 Cincinnati visits Memphis (12:00 ET, ESPN2) in an early match-up of presumed upper-echelon AAC teams, but look elsewhere if you seek a battle of stylistic comrades; the deliberate, defensively stout Bearcats (286th nationally in tempo, eighth in defensive efficiency) will look to put the clamps on an explosive Memphis squad that rarely presses the pause button (39th nationally in tempo, 19th in offensive efficiency). UConn and SMU, both 0-1 in league play, offer an alternate viewing option (2:00 ET, ESPNU), and with a visit to Louisville coming next, Larry Brown’s SMU team would be well served to get a win Saturday to avoid staring down the barrel of an 0-3 league start. ACC. 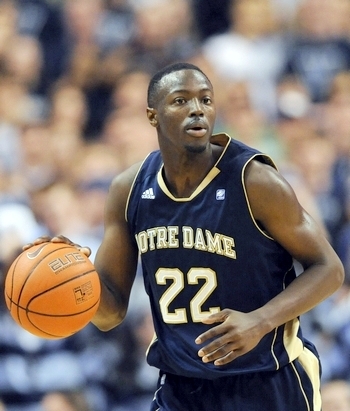 Will there be life after Jerian Grant for Notre Dame? If yes, then a visit from Duke (4:00 ET, CBS) will offer the Irish the chance to provide a more convincing affirmation than they offered in their first game without Grant – a gut-check overtime victory over Canisius. Garrick Sherman should have a chance to exploit the smallish Duke interior, no matter what Doug Gottlieb thinks about his beard. 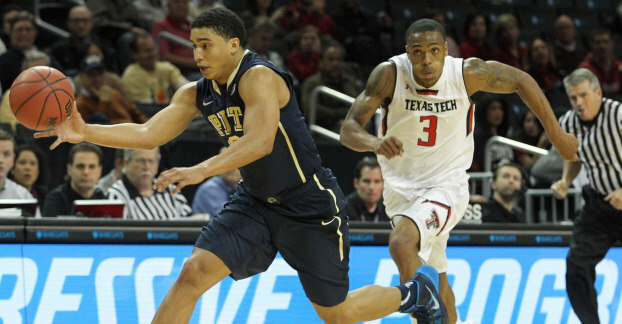 Elsewhere, Pitt and Syracuse join Notre Dame in making their ACC debuts. The Panthers visit NC State (12:00 ET, ESPN3), while the Orange play host to Miami (2:00 ET, ESPN3). And if you like defense, two of the nation’s 10 most efficient defensive units are set to meet in Tallahassee; Virginia and Florida State (5:00 ET, ESPN2) will tussle in a race to 50 between ACC sleepers. Notre Dame has had some struggles out of the gate, losing an uncharacteristic November game for the first time in Brey’s tenure and most recently blowing an eight-point lead with less than a minute to play versus Ohio State on Saturday. The loss of a team leader in Grant will set the Irish back even further with ACC play rapidly approaching. Look for McDonald’s All-American and freshman combo guard Demetrius Jackson to start playing heavier minutes and establishing himself more often on the offensive end. Senior guard Eric Atkins will likewise need to be more aggressive in looking for his shot and take on more responsibility in Grant’s absence. Don’t be surprised to also see the continued ascent of fan favorite Garrick Sherman shouldering a more extensive burden of the offense. One of four battles between Big Ten teams and probable NCAA Tournament teams from power conferences will take place in Brooklyn on Saturday when Ohio State (11-0) takes on Notre Dame (8-3). After a disappointing loss to North Dakota State, the Irish righted their ship by knocking off Indiana last Saturday at the Crossroads Classic. Meanwhile, Ohio State is ranked as the #3 team in the country, but hasn’t really played anyone of merit since they bested Maryland about three weeks ago. This one will be highlighted by guard play, but here are a few other things to look for if you’re tuning in this evening after a day of Christmas shopping (7:30 PM EST, ESPN2). 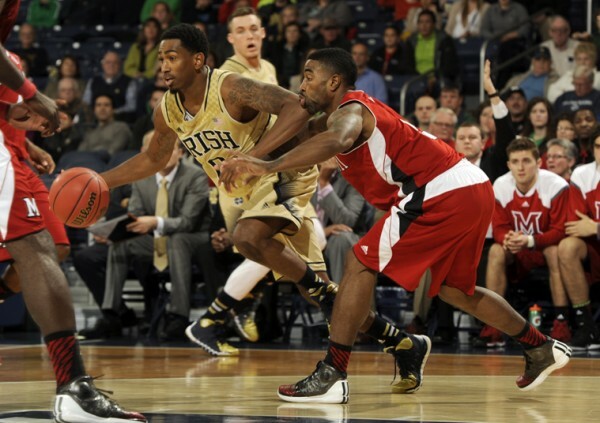 Shannon Scott will be tested by the Notre Dame guards on Saturday night. Guard Play will be a key: The best of the individual battles will be in the form of Notre Dame’s Jerian Grant and Eric Atkins taking on Aaron Craft and Shannon Scott. The Craft and Scott duo will look to do what they do against everyone — pressure and harass. Craft (2.5 SPG) and Scott (2.3 SPG) are first and second, respectively, among Big Ten players in steals per game, but Grant and Atkins are the keys to the Irish protecting the ball at the 18th best rate in the country (14.5 turnovers per 100 possessions). Experience playing under pressure like this might unhinge freshman and sophomore perimeter players, but the Notre Dame duo has been through it before. If Craft and Scott can force a steady diet of turnovers from these veterans — no easy task whatsoever — they can set the tone for an uglier game that eliminates some of the clean looks Notre Dame got against Indiana. Chicago Tribune: The biggest difference for Notre Dame’s Garrick Sherman this season? He’s playing twice as many minutes! He’s also one of the better rebounders in the ACC, getting to the line more, and blocking more shots. Not bad for a guy who averaged 15 minutes per game last season. The former Michigan State transfer is one of Notre Dame’s most important players (arguably the Irish’s most important if you consider the void left by Jack Cooley’s graduation), and although Sherman’s numbers are nowhere near Cooley’s, he’s proved to be more than capable of anchoring Mike Brey’s system.The guy to watch against Ohio State, though, is Demetrius Jackson. He’s been getting more minutes as the season progresses, and appears primed for a breakout game soon. 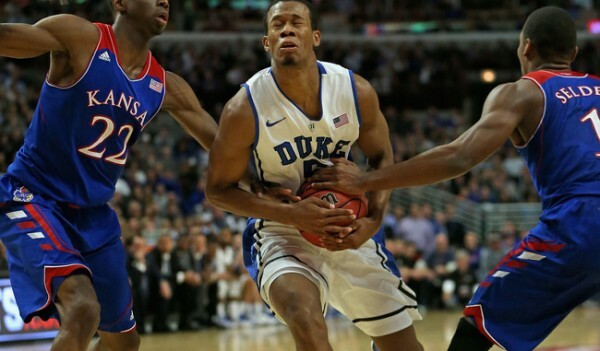 CBS Sports: Rasheed Sulaimon broke out of his early season slump last night against UCLA. He didn’t have a gaudy stat line or game — just eight points, six rebounds and five assists. But in 18 minutes of action, Sulaimon looked a lot like the player who started for the Blue Devils last year. This game was a good reminder of why he’s so important for Duke going forward, because it’s safe to say Sulaimon will get minutes if he continues to play with that intensity. What remains unclear is how much Sulaimon’s resurgence will affect Matt Jones’ minutes. Andre Dawkins will obviously see consistent (but limited) time as a potential offensive spark plug off the bench, and don’t expect Tyler Thornton to fall out of the rotation anytime soon. But that may leave Jones as the odd wing out unless Duke elects to go small occasionally. Richmond Times-Dispatch: Don’t tease me with these awesome potential series if you don’t really mean it! I’m looking at you, James Johnson. Here’s to hoping Johnson follows through and inks a long-term deal with Virginia Commonwealth sooner than later. In-state rivalries are the best, and while most people wouldn’t lose sleep over Virginia Tech not playing the Rams every year, both programs would be better off for it. Washington Post: This is a good piece looking at the questions facing Tony Bennett as Virginia takes a break for finals and the holidays. Notably, should he sub differently? What should his rotation look like? Why can’t his team hit free throws? (Crazy stat from the article: Joe Harris is hitting less than 55 percent of his free throws this year. How is that even possible?!) How does he fix the team’s abysmal assist to turnover ratio? I’m not sure all of those questions have answers, but I think finding ways to make London Perrantes more comfortable will help. And Joe Harris and Akil Mitchell have to step up and play at or near the level people expected them to coming into the season. Washington Post: Throwback! This oral history of the Syracuse–Georgetown rivalry is tremendous. It’s also long, but totally worth it whether you’re trying to brush up on a little history of the ACC newcomer or you’re just nostalgic for the retro-Big East. Check it out. VIDEO EXTRA: Missed this when this first hit, but this Seth Davis interview with Rick Barnes on his tense relationship with Dean Smith is really worth the time (h/t Laura Keeley). Notre Dame entered the 2013-14 season with a strong and experienced backcourt that will be vital to the Irish as they make the transition from the Big East to the ACC. Seniors Eric Atkins and Jerian Grant and junior Pat Connaughton were mainstays in the starting lineup of last year’s Irish and had developed a reputation as one of the most reliable perimeter groups in the country. Atkins is a true floor general who can hit timely shots and has been a strong leader for several seasons — he is the only player in Notre Dame basketball history to become a three-time captain. Grant is the scorer of the group and has the ability to get as hot as any player in the country. Connaughton, who also excels for Notre Dame baseball as a starting pitcher, is a true glue guy who does a little bit of everything. While the Irish have a proven backcourt that will certainly aid in winning a lot of games, the team’s frontcourt is still a bit of an unknown commodity. Replacing the production of graduated All-Big East forward Jack Cooley looms as a tall task. The most experienced forward in Mike Brey’s arsenal is fifth-year senior Tom Knight. After being sparingly used for much of his career, Knight took on a big role for the Irish during the second half of the 2012-13 campaign, as he was in the starting lineup for the final 16 games of the season. Fellow senior forward Garrick Sherman also brings a solid amount of experience to the fold, as he entered the 2013-14 season with 31 career starts (from both his time at Notre Dame and Michigan State). 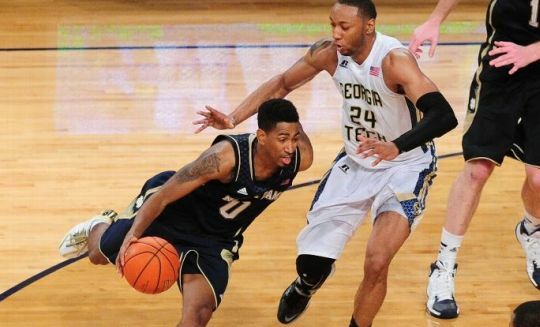 However, in his first season on the court with the Irish, Sherman battled through some consistency issues. While his season is probably best remembered for his 17-point performance in the five overtime win over Louisville, it also must be noted that he had fallen completely out of Notre Dame’s rotation in the four games prior to that epic contest. The Fighting Irish had an auspicious start to a season that was expected to represent a major step forward for Mike Brey’s program. But a slow start and sputtering finish to conference play, coupled with frustrations experienced against the Big East’s top teams, prevented the Irish from matching last year’s top three finish. Despite fielding one of the league’s most talented starting fives, a lack of depth hampered the Irish late in the season and contributed to yet another early exit from the NCAA Tournament. We ranked Notre Dame third heading into 2012-13, as did the coaches at Big East media day. Mike Brey’s roster returned its top five scorers from 2011-12 and was loaded with talented upperclassmen, namely preseason all-Big East center Jack Cooley, versatile super-senior Scott Martin and the backcourt scoring tandem of juniors Eric Atkins and Jerian Grant. The Irish raced out to a blistering start, winning 12 in a row for the first time since 2006-07. By early January, they’d blown out #8 Kentucky at home, edged #21 Cincinnati on the road, won their first two Big East games and earned a #16 Coaches Poll ranking alongside their 14-1 record. Cooley (13.1 PPG, 10.1 RPG) lived up to his first team all-Big East billing as he shot 58% from the field and led the Big East in literally every rebounding category. Deep reserve big men Tom Knight and Garrick Sherman filled the void left by Scott Martin’s absence, and keyed huge victories over the likes of Louisville, Marquette and Villanova. The highlight of the season was, unquestionably, enduring five overtimes against the eventual National Champions after Jerian Grant scored 12 points in the last 45 seconds of regulation. Brey’s program claimed its sixth NCAA Tournament bid in seven years, and has averaged almost 13 Big East wins in each of the last three regular seasons –– a figure surpassed only by Syracuse. Brian Otskey (@botskey) filed this report from Louisville’s win over Notre Dame in the nightcap of the Big East semifinals on Friday night at Madison Square Garden. Louisville’s interior defense was phenomenal. The Cardinals held Notre Dame to 12-of-31 shooting inside the arc as its guards did a great job cutting off dribble penetration. Jack Cooley and Garrick Sherman were able to score some but Louisville forced the Fighting Irish into many tough, contested twos. Louisville was tops in conference play in two-point percentage against and it showed this evening. With Gorgui Dieng anchoring the back line and guards like Russ Smith and Peyton Siva cutting off penetration and creating havoc on the perimeter, it’s a lethal combination. There’s a reason Louisville’s adjusted defensive efficiency currently checks in at a superb 80.9. The Cards are ridiculously good on that end of the floor and will be a nightmare match-up for most teams who aren’t used to seeing a big time shot-blocker and relentless full court pressure. Russ Smith has quietly had himself a tournament to remember. After scoring 28 points in Thursday’s win over Villanova, Smith hung 20 on the Irish while also dropping six dimes. Smith has been an efficient shooter in New York, making 15 of his 26 field goal attempts through two days here. After the game, Rick Pitino said Smith doesn’t frustrate him all that much with his shot selection, giving his dynamic junior some latitude on the offensive end. 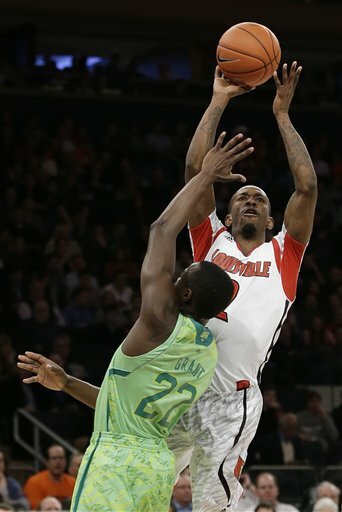 It’s on defense where Pitino gets upset with “Russdiculous,” especially when he loses his man off the ball. Smith will have to play well tomorrow night against Syracuse because the Orange will pressure him and could force him into some bad decisions. You never know what you’re going to get out of Smith and that’s what makes him a must-see player. Although his week just ended, Pat Connaughton was fantastic. In three games at the Garden, Connaughton made 15 threes, one short of the record currently held by Syracuse’s James Southerland (this year) and Gerry McNamara (2006). After the game, head coach Mike Brey said he thought his team found something this week at MSG and that would help them going forward into the NCAA Tournament. He mentioned how it would be nice if they kept shooting the ball well, no doubt a reference to his gritty sophomore from Arlington, Massachusetts. Connaughton is a typical New England kid: smart, mature for his age, seasoned, and a great competitor. He does more than shoot, too. Connaughton averages almost five rebounds per game because he isn’t afraid of contact and uses his body well in creating position. He’ll be a huge asset next week in the tournament and over the next two years as the Irish transition to the ACC. Star of the Game: You could go with either Peyton Siva (14 points, six assists, one turnover) or Russ Smith (20 points, six assists) so the point here is that Louisville’s backcourt is playing at the level some thought it would be all season long. If you recall, Siva carried this team to a Big East title last year in this building and parlayed that into a Final Four appearance. Louisville needs Smith to score and Siva to create in order to succeed and it is getting just that through two games in this tournament.